YouTube is one of the most used sited on internet. It gets billions of views every day. YouTube for Educational Purpose plays a significant role in education also as professionals. Educators and students share their education related content on this platform. 1. Show the students the clips from news stories and encourage the students to share their thoughts and opinions. 2. Search for clips on YouTube that generate topical discussion. 3. High quality educational videos are available for YouTube audience and these are short, entertaining and educational. 4. In literature classes, the videos of poets reading their works can be shown to the students. 5. Look for documentaries created by channel such as BBC and show them to students to provide context to topic. 6. Log onto YouTubeEdu that contains videos created for education purpose. 7. Create playlists to plan the future lessons. 8. YouTube clips can be shown to children who love learning things with visual content. 9. A homework task can be given to the students by sharing the URL of a particular video and ask them to research it debate on it. 10. Teachers can create a YouTube channel and create learning videos to explain topics simply. 11. Students can watch the YouTube videos on different topics are prepare a list of questions that they want to ask their teacher in the class room the next day. 12. Teachers can ask the students to watch a video and create quizzes based on the video. 13. Create videos and share the links with other schools. 14. Schools can have their own YouTube channels and share the work of their students. 15. Schools reputation can be enhanced by having videos on their own YouTube channel depicting the events in their schools etc. 16. Students can discover videos to learn basic concepts to difficult experiments. 17. YouTube videos can bring scientists into the class room and help the student learn better. 18. Teaching students with YouTube videos is more effective as these videos engage them more. 19. Do not allow students to access YouTube without guidance. 20. Help the students with the most relevant video based on video description. 21. Videos created for only targeted users such as school community can be uploaded with privacy setting. 22. YouTubeEdu is a section that can be used freely in the classroom. 24. Using YouTube videos in science and math classrooms will help to display charts and graphs. 25. Many big institutions are uploading course related videos that can be accessed for free. 26. Educational institutions are using YouTube to promote their message. 27. Schools can host their videos on YouTube and use it for local advertising. 28. Online presence of schools will give a big boost to them. 29. Many universities and schools are uploading weekly and monthly newsletters. 30. Important announcements are also being made with YouTube videos. 31. Schools can create teacher training videos and upload them on YouTube. 33. YouTube videos for education can be re watches as many times as possible. 34. Use the YouTube channel to create online community and use it for social learning. 35. YouTube videos can be watched on mobile and tablets also. 36. Whatever the screen site, this platform can be accessed for learning. 37. Note taking is important for students and they can view, rewind and replay the videos to take notes. 38. YouTube can be used to learn thing in the class and also out of the class. 39. Students can make video of what they have learned and upload it to YouTube. 40. YouTube is beneficial for educators also to reach a range of students. 41. Videos are best option for creating digital classroom. 42. Education videos are better for offering lesson to students with special needs. 43. Add subtitles and transcripts for students with special needs. 44. Some students learn better with visual content. 45. Videos lead to greater classroom connectivity. 46. Schools can use the YouTube videos to show the children notable sites around the world. 47. Pre recoded lectures and assignments help the students who were absent. 48. Students can take advantage of rich bounty of educational lectures from prestigious institutions. 49. YouTube also has invalid content and children should be denied to access this. 50. Elders should help the children to use YouTube as unique tools with great resources for education purpose. YouTube has many benefits for students and teachers. It encourages digital learning. Children are now growing with video lessons as schools are incorporating videos in their syllabus to teach children. 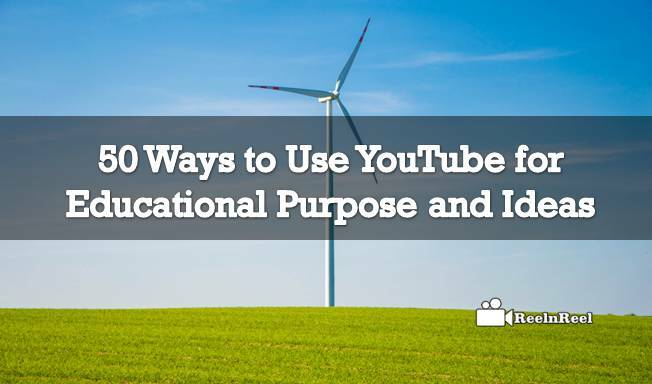 These are the ways and ideas use YouTube for Educational Purpose.